Sir Winston Leonard Spencer-Churchill, KG, OM, CH, TD, FRS, PC, PC (Can) (30 November 1874 - 24 January 1965) was a British politician known chiefly for his leadership of the United Kingdom during World War II. He served as Prime Minister of the United Kingdom from 1940 to 1945 and again from 1951 to 1955. A noted statesman and orator, Churchill was also an officer in the British Army, a historian, a Nobel Prize-winning writer, and an artist. During his army career, Churchill saw action in India, in the Sudan and the Second Boer War. He gained fame and notoriety as a war correspondent and through contemporary books he wrote describing the campaigns. He also served briefly in the British Army on the Western Front in World War I, commanding the 6th Battalion of the Royal Scots Fusiliers. At the forefront of the political scene for almost fifty years, he held many political and cabinet positions. Before the First World War, he served as President of the Board of Trade, Home Secretary and First Lord of the Admiralty as part of the Asquith Liberal government. During the war he continued as First Lord of the Admiralty until the disastrous Battle of Gallipoli caused his departure from government. He returned as Minister of Munitions, Secretary of State for War and Secretary of State for Air. In the interwar years, he served as Chancellor of the Exchequer in the Conservative government. After the outbreak of the Second World War, Churchill was again appointed First Lord of the Admiralty. Following the resignation of Neville Chamberlain on 10 May 1940, he became Prime Minister of the United Kingdom and led Britain to victory against the Axis powers. Churchill was always noted for his speeches, which became a great inspiration to the British people and embattled Allied forces. After losing the 1945 election, he became Leader of the Opposition. In 1951, he again became Prime Minister before finally retiring in 1955. Upon his death the Queen granted him the honour of a state funeral, which saw one of the largest assemblies of statesmen in the world. On 10 May 1940, hours before the German invasion of France by a lightning advance through the Low Countries, it became clear that, following failure in Norway, the country had no confidence in Chamberlain's prosecution of the war and so Chamberlain resigned. The commonly accepted version of events states that Lord Halifax turned down the post of Prime Minister because he believed he could not govern effectively as a member of the House of Lords instead of the House of Commons. Although the Prime Minister does not traditionally advise the King on the former's successor, Chamberlain wanted someone who would command the support of all three major parties in the House of Commons. A meeting between Chamberlain, Halifax, Churchill and David Margesson, the government Chief Whip, led to the recommendation of Churchill, and, as a constitutional monarch, George VI asked Churchill to be Prime Minister and to form an all-party government. Churchill's first act was to write to Chamberlain to thank him for his support. Churchill had been among the first to recognize the growing threat of Hitler long before the outset of the Second World War, and his warnings had gone largely unheeded. Although there was an element of British public and political sentiment favouring negotiated peace with a clearly ascendant Germany, among them the Foreign Secretary Lord Halifax, Churchill nonetheless refused to consider an armistice with Hitler's Germany. His use of rhetoric hardened public opinion against a peaceful resolution and prepared the British for a long war. 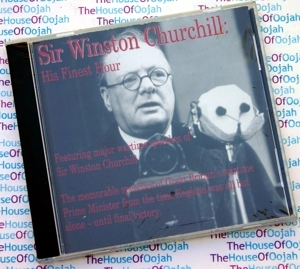 Coining the general term for the upcoming battle, Churchill stated in his "finest hour" speech to the House of Commons on 18 June 1940, "I expect that the Battle of Britain is about to begin. "By refusing an armistice with Germany, Churchill kept resistance alive in the British Empire and created the basis for the later Allied counter-attacks of 1942-45, with Britain serving as a platform for the supply of Soviet Union and the liberation of Western Europe.In response to previous criticisms that there had been no clear single minister in charge of the prosecution of the war, Churchill created and took the additional position of Minister of Defence. He immediately put his friend and confidant, the industrialist and newspaper baron Lord Beaverbrook, in charge of aircraft production. It was Beaverbrook's business acumen that allowed Britain to quickly gear up aircraft production and engineering that eventually made the difference in the war. "... we shall fight in France, we shall fight on the seas and oceans, we shall fight with growing confidence and growing strength in the air, we shall defend our island, whatever the cost may be, we shall fight on the beaches, we shall fight on the landing grounds, we shall fight in the fields and in the streets, we shall fight in the hills; we shall never surrender." Without having much in the way of sustenance or good news to offer the British people, he took a political risk in deliberately choosing to emphasise the dangers instead. "Rhetorical power," wrote Churchill, "is neither wholly bestowed, nor wholly acquired, but cultivated." Not all were impressed by his oratory. Robert Menzies, who was the Prime Minister of Australia, said during World War II of Churchill: "His real tyrant is the glittering phrase so attractive to his mind that awkward facts have to give way." Another associate wrote: "He is . . . the slave of the words which his mind forms about ideas. . . . And he can convince himself of almost every truth if it is once allowed thus to start on its wild career through his rhetorical machinery."